When working customer appreciation events, I always offer a wide range of product knowledge education modules, as well as complimentary services & lessons. Once I met a guest who desperately wanted to learn how to properly apply make-up. She did not consistently wear products, and she wanted to learn how to feel more feminine & feel beautiful. I started by showing just the basics so I wouldn’t overwhelm the guest. Foundation, blush, a matte eyeshadow, mascara, and lip color were shown. I showed her how to build the foundation properly to the desired coverage. Incorporating the proper tools was paramount in achieving the desired finish. After applying the products, I asked my guest about her experience. The feedback was extraordinary. She was thrilled that someone had taken the time to show her how to apply color & that she had a great time. My experience with customer appreciation was wonderful. I had a customer who had a major concern with damage and volume. I sat down and spoke with her about our DAMAGE REMEDY line and the benefits it would have on her hair. She was so pleased and extremely excited with this product I also mention other products for volume.She was very pleased with the service. A few days later I received a call from her telling me about her results. She’s never been more pleased. It made me feel so happy. This is what we are about at Aveda. Making a difference in the world. At the upcoming Aveda Customer Appreciation Event the one product that I would definitely buy is the smooth infusion shampoo and conditioner. I can have 20% off and great frizz free hair? This St. Pete weather has us all wondering if we should ductape our umbrellas to ourselves and wear plastic clothes. Not to mention we arent even attempting to straighten our hair but with the right foundation of smooth infusion products my prized straightening iron is going to come out of hiding. It will fight the humidity and keep my hair shiny all day and I love a 20% discount! 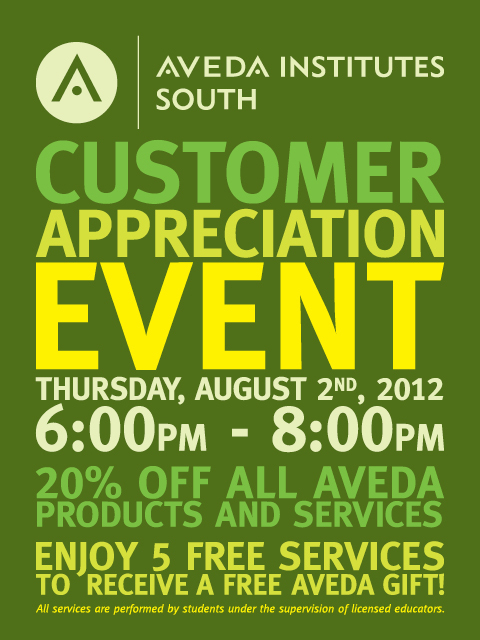 Our customer appreciation day is a wonderful event! Not only do you leave looking beautiful, but you feel beautiful, relaxed and at ease. Why wouldn’t you want to come to an event where our services are not only very affordable but on top of that your getting another 20% off of pre-booked services made that night. Our services include a variety of products and services you would love to come and enjoy for yourself. We also encourage for you to bring friends and family to enjoy this wonderful event. You will enjoy all of our natural environmental friendly products we use that cure even better to use on our hair and skin. You will automatically feel a tremendous change in your hair with our products. On our customer appreciation day we want to thank you for letting us show you a great way to get the look you want with less damage to your hair.